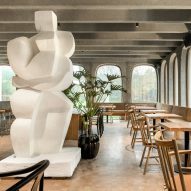 Design studio Going East has overhauled Constantin Brodzki's distinctive concrete office block in Brussels to create the second location for Belgian co-working office company Fosbury & Sons. 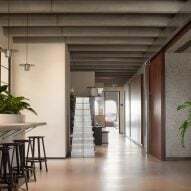 Fosbury & Sons – the co-working company founded by Stijn Geeraets, Maarten Van Gool and Serge Hannecart – has taken over 7,000 square metres of the modernist 1970s building, which helped to establish Italian-born Brodzki as one of Belgium's most innovative architects. 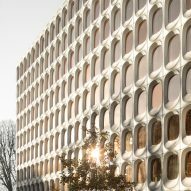 Formerly the headquarters of cement company CBR, the building boasts a distinctive facade made up of 756 oval windows in curved, pre-fabricated concrete panels. 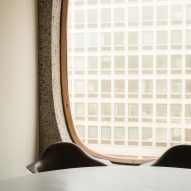 The renovation focused on making the interior feel more like a hotel or a home than an office. Corridors were removed from the layout to create more open spaces. 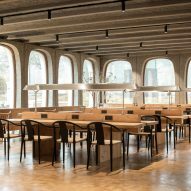 "The character of the [Brodzki] building, its history, its exceptional architecture, the spirit of the age in which it was built… it just fit," said Geeraets. "It has an extraordinary architecture and it’s also super functional." 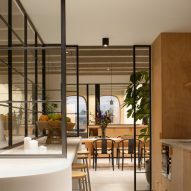 "We wanted to respect what was still there but also set out a new layout for Fosbury & Sons. 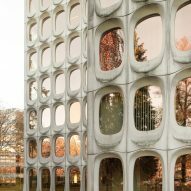 Now you have more the Japanese/James Bond vibe and before it was more modernist," she told Dezeen. The building occupies a site near to the major Brussels artery road Avenue Louise and the Sonian Forest. 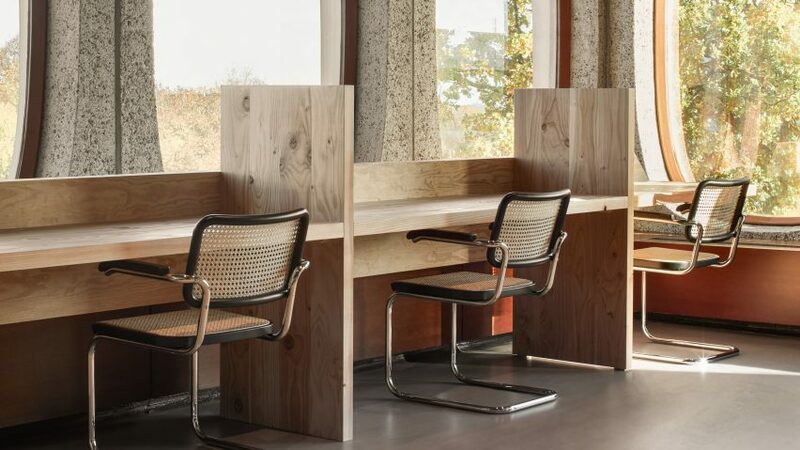 Brodzki – who moved to Belgium before the second world war – designed the original interior, in collaboration with Belgian furniture designer and interior architect Jules Wabbes. 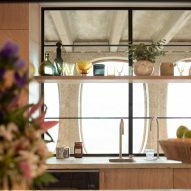 Fosbury & Sons commissioned local interior architecture firm Going East to reconfigure these interior spaces, having previously worked with the studio on a similar project in Antwerp, where the company took over the WATT Tower. 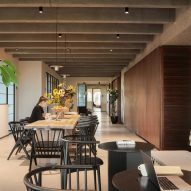 As with the Antwerp project, Fosbury & Sons Boitsfort – as it is now named – can accommodate up to 600 workers and 250 companies. Some original features were retained, but there is distinct separation between the old and the new additions. 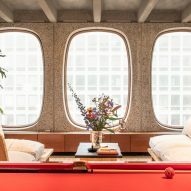 A number of custom-made pieces were created as part of the design, including marble tables, a chandelier-like lighting fixture that sits above the original curving, concrete central staircase and wooden furniture. 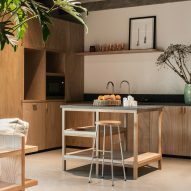 "The challenge was to make every floor as special as the previous one," said Going East's other co-founder Michiel Mertens. "Every floor needs some key elements because you want to make every member happy." 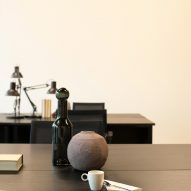 Fosbury & Sons Boitsfort features an open lobby and bar on the ground floor, 15 meetings rooms, a 75-seat auditorium, private offices spaces, shared offices spaces and a number of other shared workspaces. 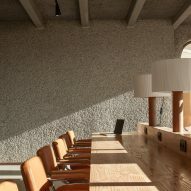 Another bar on the 8th floor offers views of the nearby Sonian Forest, and previous Fosbury & Sons collaborator Coffeelabs is managing a restaurant in the building for members. 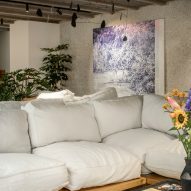 Art is also peppered through the building, provided by Brussels galleries Rodolphe Janssen and Veerle Verbaekel Gallery, as well as artists Perry Roberts and Florian Tomballe and the Private Art Support Foundation. Photography is by Jeroen Verrecht.